Photos: Rural residents rallied for protection from wind turbines after explosions; faith-based community leaders sought justice for immigrants outside County Administration Building at site that may soon be restricted for free speech rallies. June 6, 2015 (San Diego)—For years, community groups and activists have rallied outside the County administration building where Supervisors meet to protest or urge support for various causes, from immigrant rights to stopping environmentally damaging projects, with rally organizers ranging from civil liberties advocates to conservative Tea Party groups. But under a new ordinance proposed for consideration on Tuesday’s agenda, people wishing to exercise First Amendment rights may be restricted to designated “free speech zones” at the new Waterfront Park around the building, where you won’t be able to bring a megaphone, microphone, or even a chair on which to sit. There will be noise limits and gatherings of 200 or more must obtain permits—meaning you’ll have to predict how many will show up for your event, or risk paying fines. August 11, 2014 (San Diego’s East County) – A national report has singled out El Cajon as a negative example of how to handle homeless issues. According to the National Law Center on Homelessness & Poverty reported titled “No Safe Place,” El Cajon is among a growing number of cities putting homeless people in jail for sleeping in public places, without offering long-term solutions to help the homeless get off the streets and back on their feet. June 26, 2014 (Washington D.C.) – Today the U.S. Supreme Court unanimously ruled that a 35-foot buffer zone around abortion clinics in Massachusetts violate the free speech rights of protesters. But ironically, the high court has its own, far wider 100-foot-wide buffer zone to keep protesters away from the Supreme Court. Massachusetts passed its law to protect abortion workers and patients after a gunman killed two abortion clinic receptionists and wounded five others at two area clinics in 1994. Violence against abortion providers has occurred elsewhere, notably the murder of Dr. George Tiller, a doctor who provided abortions in Wichita, Kansas. Similar laws are on the books in other states, including California. But abortion opponents argued that such restrictions violated their First Amendment free speech rights. June 15, 2012 (Sacramento)—A measure requiring California State University (CSU) Trustees to designate a senior administrator as a liaison between protesting students and campus officials to improve safety and communication Wednesday won Senate Education Committee approval on a six to zero vote. AB 1955, authored by local Assemblyman Marty Block (AD 78)) also requests the University of California (UC) to name a liaison when protests occur on those campuses. May 19, 2012 (San Diego’s East County) – A federal judge has ruled that section 1021 of the National Defense Authorization Act of 2012 is unconstitutional, violating the First Amendment of the Constitution by having a chilling effect on free speech. The clause allowed the U.S. military to arrest and indefinitely detain anyone—even U.S. citizens—for providing substantial support to terrorist groups. Civil libertarians opposed the clause and journalists filed suit, arguing that the definition was so vague that reporters and political activists feared they could be indefinitely detained. 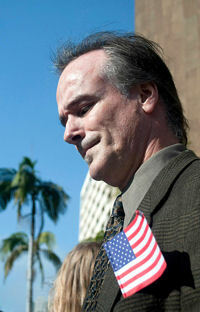 January 29, 2012 (La Mesa) – First Amendment advocates expressed shock when San Diego Police arrested La Mesa resident Mike Garcia and three others on felony conspiracy charges--a tactic customarily reserved for grave offenses such as organized crime activities and drug trafficking. Their purported crime? Interrupting Mayor Sanders’ state of the city speech with a brief “Mic-Check” protest over a free speech issue. January 11, 2012 (San Diego)—An East County comedian finds the latest rounds of arrests at the Occupy San Diego protest site to be no laughing matter. “I’m afraid to go down there. We have become a police state,” said comic Diane Jean.